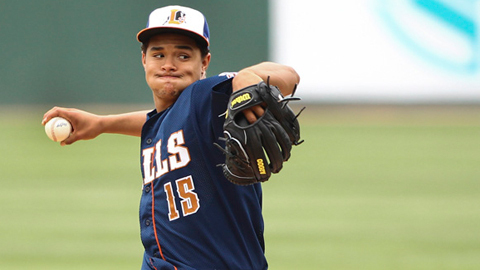 The day after Durham Bulls ace Chris Archer starts on the mound, he does absolutely nothing. The day before Archer starts, he is busy at work. But then so is Jim Paduch. "It's good to follow him" in the rotation, Archer said, "because he's got good pitch-ability -- he commands his pitches really well -- so it gives me a good read, like, 'OK, he pitched in a lot and he was successful. I can carry that over into my game.' Or: 'These guys didn't swing at his off-speed early, but he was throwing it for strikes, so I can store that.'" Archer, the Tampa Bay Rays' No. 3 -- and baseball's No. 70 -- prospect, doesn't glean this insight just from standing on the top step of the dugout. He's holding a pen, a clipboard and he's paying as much attention to the Triple-A Bulls and their opponent as anyone else in Durham. "While you're charting," Archer said, "you can get a feel for what tendencies hitters have: Do they chase? Do they swing early? Are they patient? Are they pull-hitters? Do they hit to the opposite field? Do they like to steal? Do they like to bunt? All these things, you can get a feel for the team." "After the game, I like to go over my chart, analyze it and store those thoughts and store the actual chart in a folder," Archer said. "That way, later on in the season, if I'm facing that team again, I can know how I handled them and how they handled me and let that dictate how I pitch." And how exactly is Archer pitching? Through eight starts (against six different opponents), the 23-year-old right-hander has gone 3-4 with a 5.01 ERA and a 49-to-32 strikeout-to-walk ratio. Archer's still in the process of making the necessary adjustments to Triple-A, though without one awful April 13 start, his ERA would be 3.47 for the season. MiLB.com asked Archer to describe and evaluate each of the pitches he employs. (He politely declined to grade himself using a scout's traditional 20-80 scale.) Here is Archer, in his own words. Purpose: Everything works off my fastball. If my fastball is good, hard and low, then I can throw my slider down there too and the slider might break out of the zone and they'll swing over top of it and ground out. Same thing with my changeup -- it works right off of it as well. Speed: My comfort zone with either fastball -- because they're both about the same speed -- is probably in the 92-93 mph range. I can run it up a little bit higher, but just from the numbers -- we get the charts after the game -- I'm in that range. Evaluation: I don't feel comfortable grading it -- that's for scouts -- but I will say it's my No. 1 pitch. It's a pitch I have to be comfortable with to have any type of success in this game. Origin: I started working on it a little bit this Spring Training. A guy with the Rays who throws mostly two-seamers, Burke Badenhop, just kind of asked me if I has ever thrown one, and I said I hadn't. He said it wouldn't hurt to mix it in there -- not as an off-speed pitch but something different than a straight fastball. I started playing with it in the bullpen and toward the end of camp, I started working on it more, like in games. I noticed it was a very helpful pitch. Purpose: To get a groundball out, to get the hitter to mis-hit the ball. Grip: Split the two seams in the middle of the baseball. Sometimes you think two-seamer and you want to try to get movement, so you try to manipulate the ball too much. But if you throw it just like your four-seamer with a different grip, it'll do what you want it to do. Let the grip and your normal arm-action take care of what the ball's going to do. Evaluation: It's a pitch that, when the situation dictates, it's very useful, and I feel confident throwing it. Origin: When I was younger, we had a guy who went to my high school, Clayton High School in North Carolina, and went to East Carolina and got drafted -- his name was Davey Penny -- and he had a pretty good slider. During his offseason from pro ball, before my junior season, we would play catch together and pitch bullpens together. One day, he was like, "Hey, you have the right arm-action for a slider," and he showed me the grip. At the time, I didn't know much about mechanics anyways. We tried it out, and it did work. Purpose: I like to use it [two ways]: for strikes, and I can throw it off of a good fastball and get them to swing at it and miss. Grip: An off-set two-seam grip. You really don't have to do to much with your arm. Just think fastball and, once you get in front, you make an "X," like a diagonal, with your wrist as opposing to coming straight down. You can keep a firm velocity and command the pitch by doing that. Evaluation: It's my second-best pitch. I feel like I can throw it in any situation, to any batter, in any count. Origin: Since I was in high school. I played with it on my own. Found a grip that worked for me and just threw it over and over and over. It really started to develop my first couple of years in pro ball. Purpose: The grip gives me movement as well as take away speed. Grip: Circle-change. It's kind of like the two-seam: You want to let the grip take care of the action of the baseball, not really try to manipulate it too much. Speed: 80 to 83, like 10 to 12 miles an hour off the fastball. Evaluation: I'm confident in throwing it whenever the situation dictates. I feel like I have multiple pitches I can do that with, and that's what takes me over the hump. There are some situations where people can throw only fastballs or only changeups or only sliders or curveballs, but I feel like I can throw any of my four pitches for strikes at any time, and that's helped make me succeed.